No singing telegrams from your cat to you. These are informative lyrics that entertain as well as educate. If you have questions about your cat’s behavior, the Cat Lady will sing you an answer. Why? Because it’s more fun than reading an article on training your cat to use a scratch post or to stop spraying. Typically a song is more readily remembered than black and white words on a page. The Cat Lady is tapping into that power to help you better understand Kitty. Her quirky feline-inspired musical videos can be found on Catster.com, and are just one more unique tool to help demystify cat behavior. 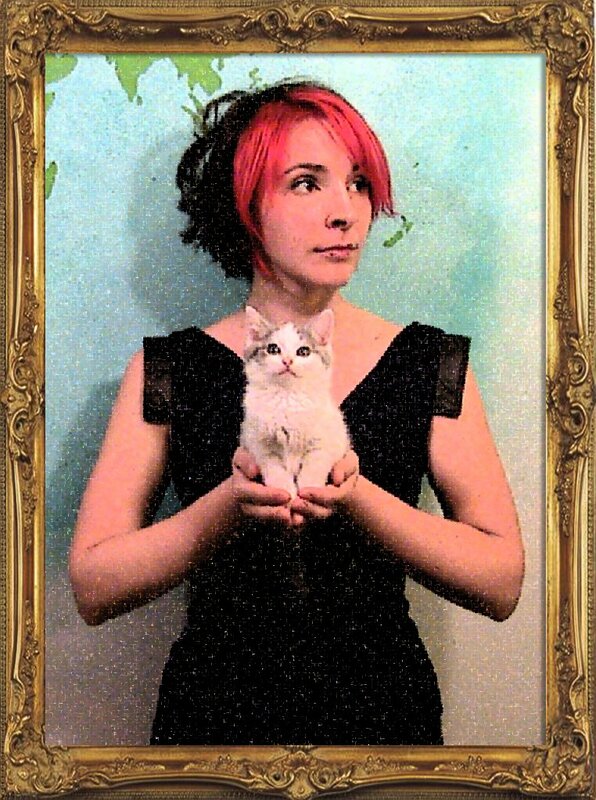 The Cat Lady is Sarah Donner, a singer/songwriter from New Jersey who will be in Portland July 7. This entertaining performer describes herself as an “indie folk pop star who embraced the cat lady inside.” Donner works the stage with powerful vocals, zippy guitar, and candid stage presence. Catch her at Alberta Street Pub with the Doublclicks that evening, or in a special appearance at the Cat Adoption Team Thrift Store in Raleigh Hills starting at 1pm. Donner didn’t start out as a cat songster. She evolved into one through offering soft songs of comfort in the final days of her family’s aging cat, Missy. Fast forward to just a few years ago; Donner’s conversion into the Cat Lady was complete when she witnessed a feral kitten rooting through her trash to find something to eat. Donner began trapping and fixing these cats, and fostering for her local humane organization. “Cats are more one-on-one,” says Donner. “It is a more intimate relationship that owners have with their pet — you have to put a bit more effort into gaining a cat’s trust and friendship. However, there is incredible value in that for both parties.” This seems to be the foundation for her videos. Donner lives with a few rescued cats. Her favorite, Puma Bean Jackson, is a smart, sleek black cat who was found in the back seat of a Triumph TR-4. After following her around the house like a little black shadow, she gave up all thoughts of finding him a home other than with her. The Cat Lady videos offer real-world solutions and easy to understand explanations of cat behavior. Donner distills endless research on a topic into answers “that have more entertainment value.” All her sources are listed so cat owners can dig deeper. Donner has written about 30 cat songs, each to answer a specific question. The stars of her Catster videos are the foster kittens who join in as she sings. You might not hear any of her Cat Lady songs during her concerts. Even though she spends hours putting them together and is very passionate about them, so far they’re just a fun release for this serious songwriter. Posted in Events and tagged with Events, Celebrity, CAT Adoption Team. July 1, 2012 by Kathy Covey - PR Manager at CAT.